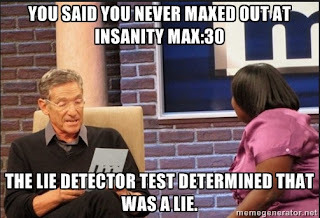 I have been sitting on this review for quite a while, as I have had the INSANITY Max 30 set since last summer and am just posting a review of the first workout now. If you've been reading here for a while, I am a huge fan of Insanity (it's supposed to be all capitalized but I am going to leave it like this from here on out). 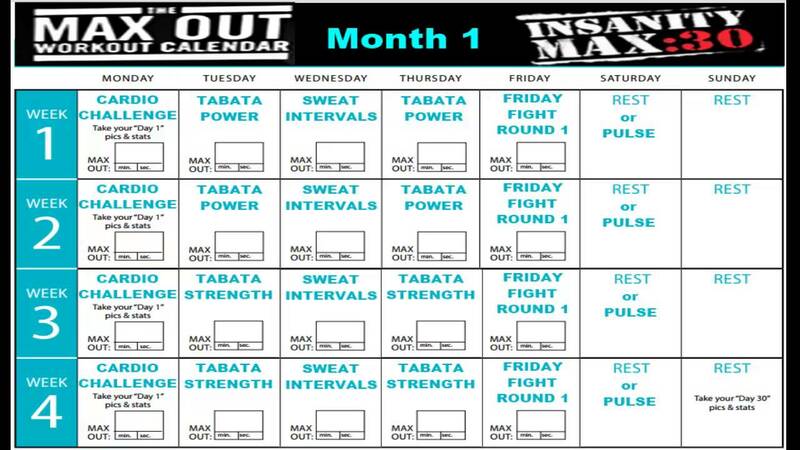 I've done the 60-day program twice and some of the workouts here and there a countless number of times over the past 4-5 years. I also own Focus T-25, which I should really get on soon, but I keep coming back to Insanity! This is my second half-attempt at doing the program. 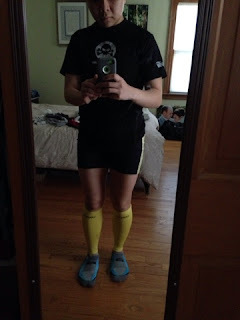 I have not been able to commit to doing a program because I don't want to cut out running right now, so I've been slowly doing this program with "everything else" in between. While I realize this is not how it's supposed to work, I do feel like my fitness level is increasing thanks to this program. 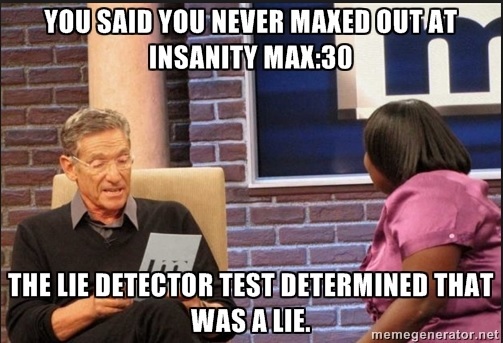 The huge upside of Max 30 is that the workouts are, as you can guess, 30 minutes long, so the 45-60 minute commitments of regular Insanity are cut in half, which is huge! So far, I have slowly cycled through a couple of weeks of the program, which actually translates to me doing each DVD a few times since that's how the calendar works. With all of my random starts, though, I've done the Cardio Challenge workout the most number of times, so I'm reviewing it now. 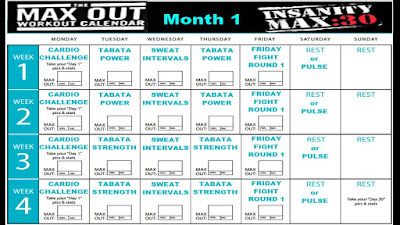 The Cardio Challenge workout, besides being an all-around good cardio workout, serves as a gauge of progress (Insanity veterans will know that as the "Fit Test"). Basically, you work out until you need to take a break outside of the ones given and then record that time as your "Max Out" time. The first time I did this workout, I "maxed out" at around the 7-minute mark, which was kind of demoralizing, but I started making it to 9, 12, and most recently, I miraculously didn't have to take an additional break at all through the 30 minutes. Maybe I wasn't pushing hard enough, because apparently this feat is not possible. Much like Insanity, the workout starts with about 5 minutes of warm-ups, which don't really feel like a warm-up at all and just goes right into it. In fact, just like Insanity, the warm-up is one of the hardest parts of the workout for me. In this case, there is a lot of jumping-jack-type moves in the warm-up, so my calves already start to tighten up in the first few minutes, but once you make it to the first break, the rest of the sequences are considerably easier (hah!) to get through. The folks in the video don't drink water during the first water break. I sometimes do, depending on how well I've hydrated prior, but I like to use the break to loosen up my legs. Then, there is a sequence of moves that is repeated three times, followed by another water break, and this pattern continues until the 30 minutes are up. The moves are reminiscent of those in Insanity but with minor changes. For example, there is this move called "hit the floor" that I really hated, but the reincarnation of this move takes out the "hands in the air" part of it, which makes the move easier but picks up the pace. The great thing about these DVDs is that you can set it up so that you only see the "modifier" on the screen. This person shows the lower-impact version of each move, which can help lessen the blow of some of these workouts. Since I haven't had problems with the impact, I generally don't follow the modifier unless I really can't crank out another rep along with the rest of the gang. 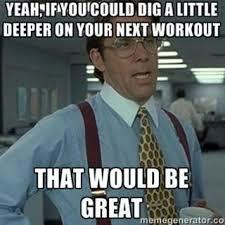 This happens mostly in some of the other workouts. I also like that the timer at the bottom is much more sophisticated and accurately shows the timing segments and the name of the moves, along with lines showing an upcoming water break. It really does apply the whole "breaking a task into small pieces" thing! There is a quick cooldown at the end of each workout, which is an active stretching that is welcome after all that intensity. Cardio Challenge also has a 10-minute add-on called Ab Attack, which is 10 minutes. 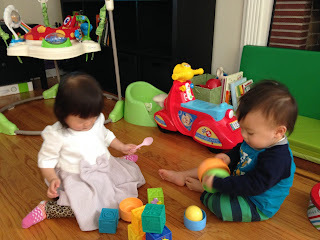 I sometimes have time to get to this, but man, it's a TOUGH ten minutes, or maybe my abs are still weak from baby-ing. The ten minutes alternates sitting/laying and plank ab moves that go on for a minute each, but I'm honestly dead by the third minute or so. Here is where I either modify or take more breaks than I should. As much as I dread these 10 minutes, it's still a short commitment. I keep telling myself that when I master Ab Attack, I might finally get close to my pre-baby shape... though at the moment, that all seems impossible. I no longer wear devices when I work out, so I don't have a calorie-burn for this, but I would imagine that someone my size (petite, average BMI) would burn around 250 calories because it's 30 minutes of cardio that is more involved than running when you're following along correctly. I know some of the other DVDs are more strength-based, so the total burn would be lower. For 30 minutes, I think this is excellent, and more importantly, you definitely feel like the 30 minutes were well-spent! As you can see, I definitely recommend Insanity Max 30 for anyone who is pressed for time. 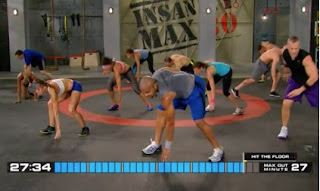 I can't say enough good things about Shaun T and am glad I have more variety that also involves being able to still work out with him. Besides how great shape he's in, I feel like his motivation is not annoying or cheesy at all. I'll be back soon to review the other Month 1 DVDs! 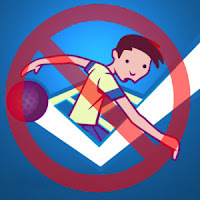 FTC Disclaimer: I purchased this product and was not compensated to provide a positive review. I am not affiliated with Beachbody in any way. Everything is pretty much a blur here lately, so it's pretty hard for me to believe that we are already in March. I have to think reallllly hard to recall the last couple of months, or even the past month. I was generally feeling a lot better about life in the second half of February, partly because I got to finally race again. I've been sleeping a bit more lately, which makes all the difference in the world. For Valentine's Day, was a bit industrious and made tea sandwiches, biscuits, and chocolate-covered strawberries for "The Ukrainian" and Tuesday. Well, the baby ate the blueberries and some plain strawberries instead of chocolate, but he enjoyed the tea sandwiches and biscuits that were made with him in mind. If you're wondering that that means, it just means that I used relatively healthy bread and no raw veggies or overly salty things. I find I barely touch the salt shaker anymore since I've started accounting the baby into my batch cooking. when the recipe comes from a Canadian site. February had also been unseasonably warm... to the point that we all got nailed with a cold and my clothes are in disarray because of the temperature fluctuations. I know illnesses are caused by germs and not weather, but somehow I find there is a correlation, even if it's not a causation. 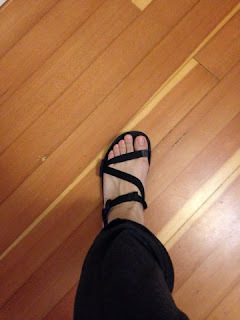 In this warm weather, I've had a chance to try out these Umara Z-Trail Sandals by Xero. 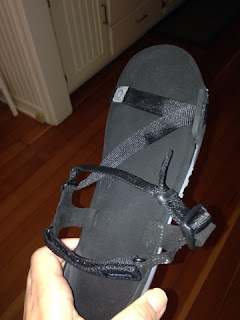 I really like this sandal because it's light and stays on my foot because of the back strap. I've actually been wearing this on errands mostly, but it does help to have something breathable and flexible for when I'm running after things without flapping around everywhere on my heels. See below for my not-so-dainty foot, made worse by pregnancy. On the topic of my "case of the runs," I ran 19 more miles in February than I "needed" to in order to reach my 366 mile-goal (one for each day) in 2016 and already have two miles logged for March, so I'm a day ahead! I'm moving slightly faster these days, though the whole weight thing has been kind of stable, unfortunately. March has always been a ho-hum month for me because it's long (31 days) with no holidays or special occasions... plus I need to tackle some rough stuff this month, but there's at least my nephew's second birthday to look forward to! It's always fun to have a glimpse of the future when I see how big he's gotten. =) I'm hoping I will continue to build my running base and make some headway in books I'm reading and studying that I'm doing. Oh, and I need to catch up on movies that I haven't been able to watch due to my sleeping much too early. Here's to what I hope will be a great March! FTC Disclaimer: I was provided a sample of Umara Z-Trail Sandals by Xero and was not otherwise compensated to provide a positive review.